TigerBlog was in the Lincoln Financial Field press box well before the start of yesterday's North Carolina-Maryland NCAA men's lacrosse championship game. Actually it wasn't as early as he'd been there the day before, when he thought the Division III final between Salisbury and Tufts started at noon, not 1. TB got there around 10 for that one. He had a purpose yesterday in being there early. He wanted to see the NCAA baseball selection show, which was on at noon, ahead of the face-off at 1. Princeton earned its spot in the NCAA tournament by beating Yale in three games in the Ivy League Championship Series. That was played two weekends ago, and those are the only three games that Princeton will have played in the month of May. The Tigers will enter the NCAA tournament as the most rested team in the tournament, though that's not exactly something that is a positive in baseball, a sport that is about repetition. TigerBlog has never been to an NCAA baseball regional, but he knew he'd be going to this one. Warren Croxton, TigerBlog's colleague in the Office of Athletic Communications, is the baseball contact. He told TB a long time ago that he had a conflict for this weekend. Princeton was coming off a 7-32 season, one that included a 4-16 record in the Ivy League that was the worst of the eight teams. When Warren said he wouldn't be around this weekend, it seemed okay. Only Princeton started winning. And never stopped. And now the Tigers are back in the NCAA tournament. Princeton was the first team to clinch a spot in the NCAA tournament, actually. And again, that's not always a good thing. Mike Mahoney, TigerBlog's colleague from Penn who was the internal PA announcer at the lacrosse games this weekend, said that he kept seeing college baseball games on TV the last few days and figured they were all repeats because of how long it had been since Penn had played. Princeton's regular season ended on April 30. Then the Tigers had to wait two weeks before playing Yale in the thrilling series that went three games. Those three games were played in two days, one on May 14 and two on May 15. That left a 15-day wait til the selection show. It finally came about yesterday. TigerBlog saw the 16 possible sites when they were announced. They are all big-time baseball schools. He mostly just wanted to go to a place he'd never been before. He was hoping for Mississippi State or Ole Miss. Instead, the destination will be Louisiana-Lafayette. TigerBlog has never been there. He looked at the pictures of the baseball facility, and it certainly looks like it'll be the big-time college baseball experience. And that's great for Princeton's players. It's a great reward for their season. As TB said, Princeton has played three games on two days in the month of May. Louisiana-Lafayette? The Ragin' Cajuns are 41-19. Of those 60 games, there were 16 that were played in May. Included in the month was a 4-0 run through the Sun Belt Conference tournament, which ended Sunday with the championship. Louisiana-Lafayette is ranked 17th nationally, and clearly this will be a big test for Princeton, especially at that stadium - "Tigue" Moore Field - where L-L is 23-5 on the year. The other two teams in the regional are Sam Houston State and Arizona. It is double-elimination, beginning for the Tigers Friday at 8 on ESPN3. Or is that 9? Is it central time in Lafayette, Louisiana? Yes. It is central. As for the other two teams, Sam Houston is 41-20 and Arizona is 38-20. Staying with the first game for a second, Louisiana-Lafayette has hit 40 home runs and 114 doubles this season. Leading the way with nine home runs and 33 RBI is Joe Robbins, who is a 5-9, 195-pound shortstop. The Ragin' Cajuns have a legitimate closer in Dylan Moore, a 6-4, 220-pound sophomore who has a 6-1 record with 13 saves and 56 strikeouts in 47.2 innings. The rest of the staff seems pretty balanced, at least according to the stats. Louisiana-Lafayette's entire roster is from either Texas or Louisiana, except for one player from Mississippi and another from, of all places, British Columbia. Baseball is a game where a few unfortunately placed line drives into fielders' gloves and well-placed bloops off of bats can radically change things on any given night. Princeton gets its first shot at an NCAA given night Friday, in what should be a great setting. The last time Princeton was in the NCAA baseball tournament was in 2011. It only seems like five years since Princeton has played a game, when in reality it will have been 19 days, 16 of which are already gone. Now it's NCAA tournament time. Thomas Sanner held the Roper Trophy as the outstanding senior male athlete in the Princeton Class of 2016 and then stepped to the microphone. This was last night, at the Grad College. 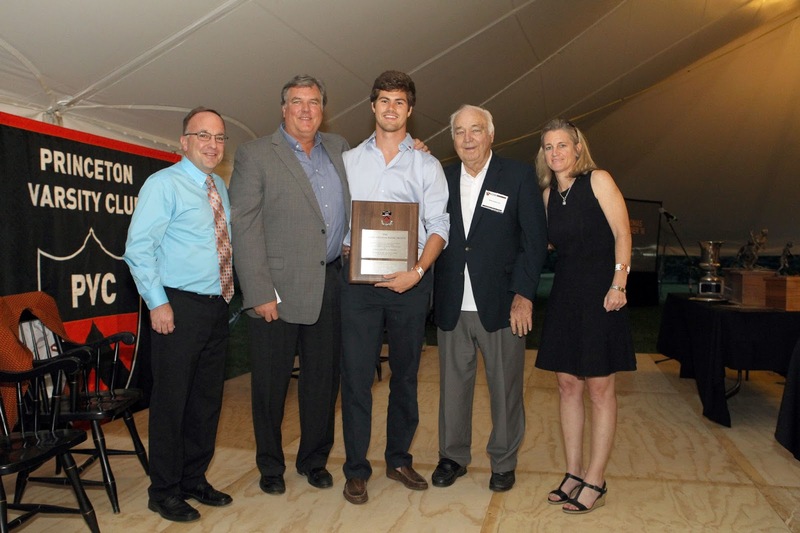 It was the Gary Walters ’67 Princeton Varsity Club Awards Banquet, the 19th straight year of such an event. Sanner graduates next week as the third all-time leading scorer in men's soccer at Princeton. On the stage as he accepted his award was his coach Jim Barlow, and he and Sanner share the distinction of being the only two players in program history to have won the Ivy League Rookie of the Year and Player of the Year awards in their careers. As Sanner began to speak, he told the story of he came to play soccer in the first place. When he was in sixth grade, this other kid in his class destroyed him in football, so he turned to soccer. And who was the other kid? D'Vauntes Smith-Rivera, who was in Sanner's class. Perhaps you know the name. Smith-Rivera? The Georgetown basketball player? 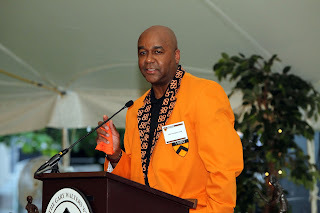 And there was Smith-Rivera's coach, John Thompson III, in the Grad College audience last night. And so Sanner mentioned the role that Thompson's guy had played in getting him into soccer in the first place. The von Kienbusch Award went to Cecilia Barowski, who actually was in Florida, winning her 800-meter heat at the NCAA track and field regional at about the same exact moment as her name was being announced as Princeton's top senior female athlete. The banquet continues to be one of the best events at Princeton. Held the Thursday at the start of Reunions, less than a week before graduation, it is meant to be a party, a celebration of the senior athletes. For the Class of 2016, there is no shortage of things to celebrate. The Class of 2016 has combined for a total of 151 All-Ivy League honors and 14 All-America honors. You are world-class athletes, and you are scholars and committed citizens. Members of the GREAT class of 2016 have won some of the University’s and the nation’s most prestigious awards – we have a Rhodes Scholar, Shapiro prize winners, A SINSI winner and a Pyne Prize winner, 2 Spirit of Princeton Winners, Academic All-Ivy and Academic All america’s, and Ivy Players of the year, to name just a few. That's a pretty impressive list of accomplishments. What really stood out to TigerBlog from last night, though, was the contrast in speeches given by Clayton Marsh and John Thompson III, who was there for more than just to be part of Sanner's story. Contrasts that were perfect complements. Marsh was given the Marvin Bressler Award, which is given to that member of the Princeton family who, through heartfelt support of the University’s student-athletes and coaches, best embodies a belief in the lifelong lessons taught by competition and athletics as a complement to the overall educational mission. If anybody TigerBlog has ever met can be described as "affable," it's Clayton Marsh. TB can't remember a time he ever talked to Clayton when he wasn't met with a big smile and a sense that Clayton was completely engaged in the current subject, whatever it was. 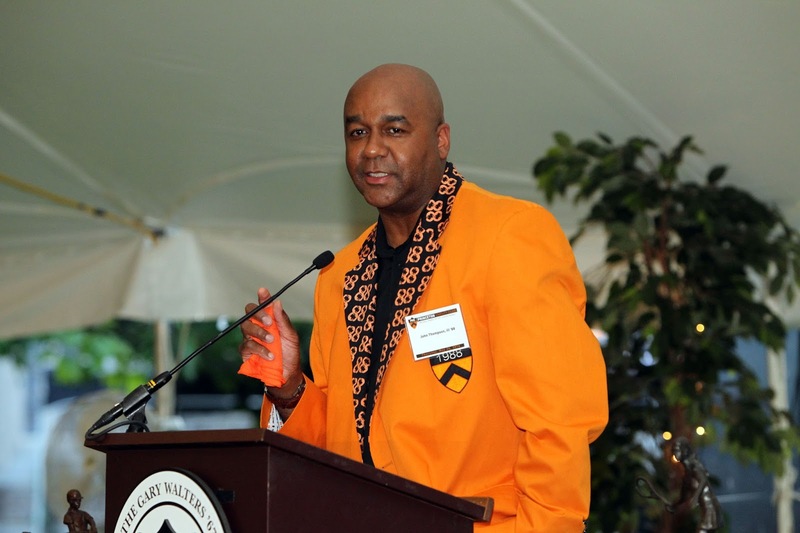 A 1985 grad, Clayton had worked with Princeton athletes for nearly 15 years, first as University counsel and then as Deputy Dean of the College. His talks at freshman student athlete orientation were legendary, especially when he'd implore the incoming students not to be "sheep" in their educations. Last night, though, Marsh's talk wasn't about that. Clayton has left Princeton and is heading to Arkansas to begin work on a new educational venture. As he accepted his award, he talked about when he was a graduate and how he wandered the campus, looking for direction, unable to leave Princeton. And how when he came back, he lived across the street from the Grad College and had his dogs torment the golfers at Springdale. But his point was a serious one. No matter where you go. No matter what you do. Take a piece of Princeton along. Never let go of the University. In other words, the things that have changed you during your Princeton experience should continue to help shape and guide you as you move forward. Stay a part of the Princeton campus. And then it was Thompson's turn. His award was the Class of 1967 Citizen Athlete Award, for outstanding contribution to sport and society. TigerBlog has met a lot of people in his nearly three decades at Princeton. He hasn't met too many who are more universally liked than John Thompson III. In some ways, Thompson is wasting his time as a basketball coach, since he is wired perfectly for another profession in the same city in which he currently works - politics. He is smart, he is practical and, perhaps from the same DNA that made him such a great passer as a basketball player, he is always able to see the big picture of every situation. He can work a room like nobody else TB knows, and last night was no exception. Anyone who wanted to say hello found him the way he always is - easily approachable and happy to share a moment or two, whether it was with an old friend or someone he'd never before met. John is also fiercely loyal man, and he has always had two homes to which is shows that fierce loyalty - Georgetown and Princeton. And even though he has been at Georgetown for 12 years now, he still very much considers Princeton home. He talked to the grads about their coaches and the effect that they've had on them during their four years at Princeton. He talked about his own coach, Pete Carril, and how he's still in his head. But then he spoke more globally. In a fascinating way, one that spoke to the value he places on service and why he was - and his wife Monica, with their work through the John Thompson III Foundation - being honored with such an award in the first place. He asked everyone to stand, and then he said that the entire group represented the entire population of the world. And then asked people at certain tables to stand, representing percentages of the group at the Grad College and contrasting that with percentages of people in the world. People who are hungry. People who live their whole lives within 100 miles of where they were born. People without clean water. People who can't read. And then he asked one person to stand. As coincidence would have it, that one person was Annie Tarakchian, who in addition to being a standout basketball player for four years is probably the Princeton athlete who attended the most events of other teams. It seemed that any event TigerBlog went to, he saw Annie there. TB isn't sure if Thompson realized who Tarakchian was. Maybe he did. It doesn't matter. Anyway, he said that she represented the 1/100th of one percent who have the opportunity to attend an elite university like Princeton. And with that comes a responsibility to give back, to help those who fall into the other groups. It was incredibly effective. And it tied in with what Marsh had said so well. Keep Princeton with you, and part of that is understanding the great opportunity you've had the great fortune to experience. With that, though, comes that responsibility. When the night was over, it was off to Reunions for the grads-to-be. The lessons from Marsh and Thompson could wait, TigerBlog supposed. This was a time to continue the party. The Class of 2016 earned it. The 1994 Princeton women's lacrosse team won its first 14 games before being tripped up by Maryland in the regular-season finale. Final score - Maryland 12, Princeton 10. The 1994 Princeton men's lacrosse team also had one regular-season loss, to Brown in the seventh game. Final score - Brown 7, Princeton 6. So what happened come NCAA tournament time? The women beat Maryland in the championship game. The men beat Brown in the semifinals. The score of both games? Princeton 10, other team 7. The men still had another game to play after the win over Brown. This was on Memorial Day, in the final against Virginia. The game was played at Byrd Stadium, which is now called Capital One Field at Maryland Stadium. It was the same field where the women had beaten Maryland one week earlier. 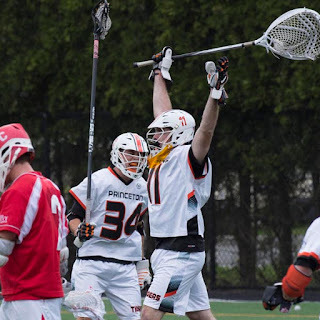 Kevin Lowe, the all-time leading scorer in Princeton men's lacrosse history, made his 247th and final point his biggest, scoring in overtime against Virginia to give Princeton a 9-8 win and the championship. To TigerBlog, the 1994 championship is the most important of the six that Princeton has won, even if it tends to get overlooked a bit. The 1992 title was the first, but that could have gone down as a one-hit wonder if Princeton had not won another one. Princeton reached the semifinals in 1993 but lost to Syracuse. Yes, Princeton had established itself as a real factor in lacrosse at that point. The 1994 championship stamped Princeton has elite. It led to the flood of talent that followed, resulting in the great run of three-straight championships from 1996-98 and then the three more finals appearances in a row from 2000-02, including the 2001 title. No team has matched the three straight championships since Princeton did it, by the way. It won't happen for awhile either, as the defending champion Denver Pioneers will not be repeating. And something no one else has ever done, before or since? Win the men's and women's championships in the same year. Only Princeton in 1994 has ever done it. That could change this weekend, as two teams have a shot at it. Beginning tomorrow and running through Monday, the Philadelphia area will crown five different lacrosse champions - in Division I, II and III men's at Lincoln Financial Field and in Division I and III women's at Talen Energy Stadium (the home of the Philadelphia Union). It all begins tomorrow, with the Division I women's semifinals, Maryland-Syracuse and North Carolina-Penn State. The Division I men's semifinals, North Carolina-Loyola and Maryland-Brown, will be Saturday. Clearly, Maryland and North Carolina can win both. Maryland, though, is the No. 1 seed in both tournaments. In women's lacrosse, Maryland is 21-0, including 3-0 against the other three teams in the Final Four. On the other hand, Maryland's wins were by five goals over Syracuse but just one goal over North Carolina and Syracuse. On the men's side, TigerBlog has thought for the second half of the year that Brown is the best team. The Bears, making their first NCAA appearance since that 1994 game against Princeton, are playing on an incredible level. The thought about Brown is that they play a style most other teams don't, a fast-paced, push-it-all-the-time, no-shot-is-a-bad-one, keep-the-poles-on-offense track meet. There's some truth to that, but the reality is that Brown just has superior, veteran players throughout its lineup. The big if, of course, is Dylan Molloy, the best player in the country. Unfortunately for Brown, he's also injured, and he missed the 11-10 win over Navy in the quarterfinals last weekend. When the tournament started, TigerBlog thought the team that could beat Brown was Denver, because of its face-off man and ability to match goals. Can Maryland beat Brown? Definitely. To do so, the Terps will need to make it a half-field game, because no team is better in 6-on-6 defense than Maryland. And it's not really about winning face-offs. It's about limiting the damage off of face-off losses. If Will Gural, Brown's face-off man, can create two or three goals off of face-off transition - maybe scoring himself or maybe just starting the fast breaks - that might be too much for Maryland to overcome. The easy analysis is that it took a ridiculous 21-save performance by Navy goalie John Connors to keep that game close last weekend. Can Maryland's Kyle Bernlohr match that? He was first-team All-America a year ago. Brown's team already plays with a chip on its shoulder. Now it has the "nobody thinks we're good without Molloy" piece to go with it. TB will be at the Linc for the men's games. He'll definitely have an eye on the NCAA baseball selections show Monday to see where Princeton, the Ivy League champ, will be headed. And this is also the weekend for NCAA track and field regional in Florida, where 22 Princeton athletes will compete. And the NCAA women's rowing championship in California. As for the lax, TigerBlog will go with Maryland-North Carolina in the women's final and Brown-North Carolina in the men's final. He'll take Maryland and Brown to win. And the 1994 Princeton teams to remain unmatched. Quick - who is the all-time leading scorer in men's basketball at Princeton? Bill Bradley obviously. He scored 2,503 points in three years without a three-point shot. Nobody else is really all that close to him. Ian Hummer, with 1,625, is second. If you don't feel like doing the math, that's 878 points short of Bradley. Second question - who is the all-time leading scorer in men's basketball at Villanova? Hmmm. This is a team that just won its second NCAA championship. It has a long history of basketball success, with names like Ed Pinckney, Doug West, Scottie Reynolds, Howard Porter, Lance Miller (TigerBlog's least favorite Villanova player, but he'll get into that later), Bill Melchionni and so many others. In fact, Villanova has 16 players who scored more points than Hummer did at Princeton and eight who scored more than 2,000. No Wildcat has reached Bradley - the record is 2,243. It's Kerry Kittles, the newest addition to the Princeton Athletics family. TigerBlog didn't realize that Princeton's new assistant men's basketball coach was the all-time leading scorer at Villanova. He did know that Kittles was a high NBA draft choice, thought he didn't realize he was the No. 8 pick in the 1996 draft. Kittles would play eight seasons in the NBA (seven with the Nets, one with the Clippers) and average better than 14 points per game. Since finishing his NBA career with with the Los Angeles Clippers in 2005, Kittles returned to his undergraduate alma mater, Villanova, to earn his MBA, which he completed in 2009. Since 2010, he has served on Villanova’s President’s Advisory Council as an ambassador for the university, developing opportunities for students and alumni by engaging with the school’s corporate relationships, mentoring students and alums, and promoting academic success and career development. His first year at Princeton will be with a team that reached the NIT a year ago and returns all five of its starters, not to mention another player who missed all of last year but has started 77 games in his career. Bringing Kittles on board seems like a huge plus for the Tigers. He clearly has instant credibility with his educational and athletic background. Hey, how many Ivy League basketball coaches ever can say that they are the all-time leading scorer at a Division I school and they started 455 NBA games? Maybe nobody ever? Who is TigerBlog forgetting here? Here's another question - who averaged more points per game in his NBA career, Kittles or Bradley? It was actually Kittles. Bill Bradley averaged 12.4 per game - though in fairness he did play on one of the greatest "share the ball" teams in NBA history. Oh, and why does TigerBlog dislike Lance Miller? If you're a longtime Princeton fan, you know why. It was Miller who scored the game-winning basket in Villanova's 50-48 win over Princeton in the 1991 NCAA tournament opening round game. That was a tough one for TigerBlog. It still ranks among the most brutal defeats he's experienced at Princeton. The game was at the Carrier Dome in Syracuse, and TigerBlog was all by himself, in the football press box, seemingly 100 miles from the basket - the far basket at that - in the football end zone, when Miller scored. It was Kit Mueller's last game at Princeton, and it was the third straight year that Princeton had lost a tight one in the NCAA opening round. Princeton would be back the next year, 1992, with a 51-43 loss to Syracuse in Worcester. After that, Penn would win the next three Ivy titles. The 1995-96 season, which included a sophomore point guard named Mitch Henderson, would see Princeton return to the NCAA tournament. Perhaps you remember that year? Princeton beat Penn in a playoff and then beat UCLA in the opening round. The coaching staff of the 1995-96 Princeton team was extraordinary. It featured a Hall-of-Fame head coach - Pete Carril - and then three assistant coaches - Bill Carmody, Joe Scott and John Thompson III. Within six years of that game all three assistants would have become head coaches; within eight years, all three would have taken his own team to the NCAA tournament. How many times has this been equalized? A staff with a Hall-of-Famer and three assistants who would take their own teams to the NCAA tournament? Somebody look that up for TigerBlog. Anyway, half of that coaching staff has been reunited, as Joe Scott has now joined the staff of Bill Carmody at Holy Cross. Carmody took Holy Cross to the NCAA tournament this past year, his first in Worcester, and won the play-in game. Scott comes back to the East after being the head coach at Denver. TigerBlog most recently saw Scott in February, when TB was out there for lacrosse and while there saw one of Scott's games and met up with the coach for pizza. Like Kittles at Princeton, Scott adds a lot to Carmody's staff. If you're a Princeton fan who has never met Carmody or Scott, they are among the most unique people TigerBlog has ever met. And among the best. And, if you're a Princeton fan, you have to be pretty excited about the 2016-17 season. Exaggerator won the Preakness Stakes Saturday by 3.5 lengths. When he got back to the barn, he probably told the other horses he won by twice that. Get it? Exaggerator? C'mon, that was funny. Okay, TigerBlog can't be the only person to have made that joke. Still, it was funny. TigerBlog isn't a huge horse racing fan. He was interested to see if Nyquist was going to win, following up on his win in the Kentucky Derby two weeks earlier. It had been 37 years since there had been a Triple Crown winner when American Pharaoh swept the Derby, the Preakness and the Belmont Stakes. Before that, the most recent winner had been Affirmed in 1978. A year earlier, Seattle Slew won the Triple Crown. Would there be back-to-back winners? Not this time. Not after Exaggerator ruined everything. TigerBlog was in his car, driving back from Brown, when the Preakness started. He flipped through the stations but couldn't find a broadcast of it. So how did he find out who won? Twitter. Don't worry. He didn't check while he was driving. TigerBlog has often wondered how much his teens and 20s would have been different had things like Twitter, texting, email and the like existed back then. Certainly his own kids couldn't possibly fathom a world in which they didn't have their phones and access to all of their social media. One thing that is clear regarding Princeton's athletic social media efforts is that posts on Instagram get way more "likes" than those on Twitter. Why is that? Probably because the students themselves are the ones on Instagram. Twitter is probably used more by alums, parents, fans and those who might be a little older. Take, for instance, the stories about the announcements of the finalists for the Roper Trophy and von Kiensbusch Award. Those two combined for 200 likes on Instagram. On Twitter? They combined for 21 likes. That's roughly 10 times more on Instagram. Princeton Athletics - @putigers - has nearly 13,000 Twitter followers. There are nearly 1,000 who get live updates from @putigers_live. Princeton athletics on Instragram, though, has approximately 2,800 followers. Despite that, the number of likes is off the charts from that smaller group. As for Twitter, for TigerBlog it has become the best way to get in-game updates of events, especially Princeton events. The live updates from @putigers_live are pretty thorough. At first, Princeton had just one Twitter site, until it became apparent that users were getting turned off by having too many updates flooding their feeds. That's when @putigers_live was born, and in the two years since, followers to the original site have more than doubled. When the live update feed began, it became apparent that it couldn't just be updates of home games that someone from the OAC was already going to be. It had to be basically every game, home and away. This, of course, meant games on the road, when the OAC contact didn't travel and may have been at, you know, the movies or a restaurant or something like that. TigerBlog followed the Princeton softball team in the NCAA tournament this past weekend through Twitter. The Tigers lost the regional opener 7-0 to host James Madison and then were eliminated on Day 2 with a 2-1 loss to Longwood. Princeton had the tying run on base in the seventh of the second game. Princeton's only run in the tournament came on a home run by Keeley Walsh, a freshman who was an honorable mention All-Ivy League selection this year. There is a great picture on the softball page of goprincetontigers.com that shows Walsh and head coach Lisa Van Ackeren after Walsh's home run. It's apparently hard to pull an upset in the regional at the NCAA softball tournament. There were 16 of them last weekend, and 13 of the hosts advanced to the Super Regionals this weekend. James Madison, for instance, destroyed its regional, outscoring Princeton, North Carolina and Longwood by a combined 22-2 this past weekend. The Dukes will now be home again against LSU in the Super Regional. As for Princeton, the 2016 season ended in the NCAA tournament. Any season that does is a big success. Van Ackeren took Princeton to second-place finishes in the division in each of her first three seasons to the Ivy championship and NCAA tournament this year. Her program is clearly pointed in the right direction, and she has established herself as one of the bright lights in Ivy softball and Princeton Athletics. There was an Instagram picture at princetonathletics of the softball team prior to the NCAA game against James Madison. The team was wearing its travel Princeton shirts, and the players had their NCAA passes draped around their necks. It drew 135 likes on Instagram. After all, what's not to like about where Princeton softball was - and is going? TigerBlog is pretty sure that the last time he was at Brown Stadium was for the 2001 Princeton-Brown football game. They haven't moved the stairs any closer to the press box in the last 15 years. The Ivy League has eight football stadiums, obviously. There are long walks straight up to the press boxes in three of them - Harvard Stadium, Franklin Field and Brown Stadium. TigerBlog has been to the other two a bunch of times, since they also host lacrosse in addition to football. Brown, though, plays its lacrosse games on Stevenson Field, which is with the rest of the athletic facilities, about a mile from the football stadium, which is tucked into a residential neighborhood. Princeton defeated Brown 34-14 in the 2003 football game in Providence, but TB doesn't think he was there. He knows he was there two years earlier, when Brown beat Princeton 35-24, and going back before that, he was at every Princeton at Brown football game in the 1990s. TB has always liked Brown Stadium, which is a nice place to see a game. It was built in 1925, and if TigerBlog isn't mistaken, it was the newest Ivy stadium until Princeton Stadium was built in 1997. From 1990 through 2009, Princeton reached the NCAA men's lacrosse quarterfinals every year except for four - and went further most of the time. In fact, Princeton's record of success in that time is extraordinary. Beginning in 1990, when Princeton made its first ever NCAA tournament appearance, the program won six NCAA championships, reached the championship game two other times, made 10 total Final Four appearances and had a run of 15 quarterfinals in 20 years. It's one of the greatest runs any Ivy League team has ever had in any sport. It started with the legendary "dynasties are boring" quote as Princeton first started to crash the party with the sport's establishment, and it continued as Princeton became one of lacrosse's great dynasty. Of the five times that Princeton did not reach the quarterfinals in that time, three of them came in years that Princeton Stadium was the predetermined site for the event. That was in 1999, 2005 and 2007. TigerBlog knows full well how much effort goes into putting on the quarterfinals. It's fun too, especially if you're the kind of lacrosse fan that TB is. But it's a lot of work. And it's less fun when your team isn't in it. When TigerBlog got an email from his friend and Brown colleague Chris Humm saying that he was looking for volunteers for the quarterfinals at Brown Stadium, TigerBlog responded saying he was in. No problem. And so there he was Saturday, in Providence, back at Brown Stadium, for the doubleheader. And there he was, making the walk up the stairs to the press box, for the first time in 15 years. Patrick Stevens, one of the top lacrosse writers in the country, tweeted that he had gone downstairs and come back up, this time "without a sherpa." Now that's funny. The first game was between Syracuse and Maryland. TigerBlog thought Syracuse would win the game, largely because of the edge the Orange had in face-offs and because of how well the SU goalie had been playing since becoming the starter. As it turned out, Maryland didn't care about either of those things. The Terps, the top seed, rolled past Syracuse 13-7. TigerBlog wasn't all wrong: SU's Ben Williams won 15 of 24 face-offs in the game. It's just that Maryland got better goalie play and, in the most simplistic analysis that TB can offer, was just better. The second game matched Brown and Navy. This was an already intriguing matchup made even more so with the absence of the Bears' - and college lacrosse's - best player, Dylan Molloy, who injured his foot late in Brown's opening round win over Johns Hopkins. Navy got an epic performance from goalie John Connors, who made 21 saves, many of them ridiculous, to keep his team in the game. In the end, face-offs meant way more in this one than they did in the first game, as the Bears' Will Gural won 18 of 24. More than that, he won the face-off each of the times in the second half after a Navy goal cut the lead to one, at 8-7, 9-8, 10-9 and finally 11-10. Each of the first three times, Brown scored on that possession, and Navy would never get possession in the box again after the fourth. Molloy's status for the Final Four is uncertain. With a healthy Molloy, TigerBlog doesn't see a team that can beat Brown, not even Maryland. Even if he can play, though, Molloy won't be 100 percent. What percentage of Molloy there is, if any, will go a long way to determining who the champion is. The matchups in Philadelphia this coming weekend will be North Carolina vs. Loyola in one semifinal and Brown vs. Maryland in the other. TigerBlog's pre-tournament Final Four was Syracuse (wrong), Denver (wrong), North Carolina (right) and Brown (right). Princeton has won its six NCAA championships. Cornell has won three, all in the 1970s. No Ivy team has won one since Princeton in 2001. Brown has been to the Final Four before, back in 1994. Its opponent? Princeton, who knocked the Bears off 10-7. That was on the way to NCAA title No. 2 for the Tigers. There would be four more to come during that dynasty. As someone who was there for all of it, TigerBlog can tell you that it wasn't boring in any way. TigerBlog stepped back in time yesterday. There he was, at the last of the department staff meetings for 2015-16, and there was Gary Walters, Ford Family Director of Athletics emeritus at the podium speaking. It was like the scene in the wildly underrated "Godfather Part III." You know. "Just when I thought I was out ... they pull me back in." And yeah, TigerBlog called the movie "wildly underrated." If there had only been "III" and not "I" or "II," then people would consider "III" one of the greatest movies ever made. That's TigerBlog's thought anyway. It is a great movie on its own. Meanwhile, back at Gary, he was at the staff meeting yesterday to help the current AD, Mollie Marcoux, announce the Lorin Maurer Award for 2016. Lorin, for those who don't know, was killed in a plane crash outside of Buffalo back in 2009, when she was the Athletic Friends' group coordinator here. She was just past her 30th birthday when she died. The award that bears her name is given to a member of the Department of Athletics who "best reflects the passion, dedication and infectious enthusiasm that defined Lorin Maurer's character and her inspiring impact on colleagues and friends." This year's winner was Kim Meszaros, whose title is, well, TigerBlog doesn't really know what her title is. He does know that it doesn't matter what her title is or job description says. She does basically everything around here to keep the place - and its AD - running smoothly. First with Gary. Now with Mollie. And that's why it was so nice to have both of them - and Kim's husband Greg - there yesterday to salute Kim, who was probably embarrassed by the whole thing. The entire department gave her a standing ovation. It wasn't the first award for Kim, who previously won the University's prestigious President's Award. That award goes "to recognize members of the support and administrative staffs with five or more years of service whose dedication, excellent work and special efforts have contributed significantly to the success of their departments and the University." TigerBlog wanted to start out today by offering his congratulations to Kim. Also part of yesterday's meeting was a salute to the Princeton coaches who were named Ivy League Coach of the Year this spring. There were three names on the list - women's open rowing coach Lori Dauphiny, women's tennis coach Laura Granville and women's track and field coach Peter Farrell. During the meeting, TB sent a text to Mollie telling her that while the meeting was in progress, two other coaches had also been named Ivy Coach of the Year. Only one of them was at the mandatory meeting. That one was Scott Bradley, the baseball coach. Bradley took his team from the worst record in the Ivy League a year ago to the Ivy League championship this year. Princeton had five first-team All-Ivy League baseball players as well. That's the most the team has had since 2000. You can read all about HERE. The other Coach of the Year was Lisa Van Ackeren, the softball coach. Her team, which also won the Ivy League championship, had two first-team All-Ivy League selections, including Kaylee Grant, the first Princeton freshman softball player in 10 years to be first-team All-Ivy. Van Ackeren wasn't at the meeting, even though, as TB said, it's mandatory. She had an excused absence though. Van Ackeren and the rest of the softball team is in Harrisonburg, Va., to open the NCAA tournament today at 4:30 against James Madison. The other two teams in the regional are Longwood and North Carolina. If you don't want to click on the link, TigerBlog can tell you that James Madison is 46-4. That's a pretty good record. That's the same record the Golden State Warriors had after 50 games this year. The note that leaped off the page at TigerBlog is that James Madison has two pitchers who account for 235 2/3 innings - all but 12 the team played this year - and both have an ERA below 1.00. Still, it's the NCAA tournament. Anything can happen in a short regional, and, in baseball and softball, it's double elimination. The baseball selection show, when Princeton will find out where it's going in that tournament, will be on Memorial Day. When the show comes on, TigerBlog will be at Lincoln Financial Field, for the NCAA men's lacrosse championship game. This weekend is the lax quarterfinals. TigerBlog's pick a week ago to win it all, Denver, went out in Round 1 to Towson. His other three Final Four teams - Syracuse, Brown and North Carolina - all won, and he'll stay with them. The team best built for a championship run is probably Brown, with the face-off man (Will Gural), goalie (Jack Kelly) and superstar (Dylan Molloy), as well as an outstanding, deep, veteran supporting cast and a somewhat unique style of play. Certainly Brown looked the part of a champion last week against Hopkins. Next up for the Bears is Navy, who with its defense and goalie has as good a chance as anyone to slow Brown down. The quarterfinal is a tough round in the tournament, with the reward of the Final Four trip out there. Navy cannot play from behind against Brown, so the first quarter of this one will be important. The Towson-Loyola game is a toss up, and both have looked really good of late. And maybe TB is selling Maryland a little short, since the Terps are No. 1 and haven't lost since March 5. TB just thinks Syracuse matches up well with Maryland, with its face-off man and settled goalie position. He'll be surprised if this game isn't a one- or two-goal game. Whatever happens, TB will be there to see it up close, as he'll be in Providence for the doubleheader tomorrow. With an eye on how Princeton is doing in softball. The forecast for one week from today in Princeton is for a high of 84, a low of 61 and a slight chance of showers. Every now and then, TigerBlog thinks of an idea for a particular day and then looks back a year or two or so ago to see if he'd written the same thing before. He figures that if he can't remember then nobody else would either, though he likes to see. TigerBlog likes to say that the average temperature of the annual senior awards banquet is 70, since it seems like it's either 90 or 50. He hadn't looked at the 10-day forecast for Princeton until just now, and he chuckled when he saw that the forecast for the banquet one week from today is for a high of 93. For the record, TigerBlog will take the under on that one and is predicting a pleasant, comfortable evening. That was exactly 52 weeks ago. Interesting. There is one week until the 19th banquet. There aren't too many people who have been to all of the first 18, and TigerBlog is among them - he wasn't at the first, which was a small gathering held in Jadwin Gym. He's been to every one since, and he knows that the weather has always been a big topic of conversation. As TB thinks back, though, there's only been one time where the weather really wiped out the evening, forcing the awards to be given the following afternoon in Jadwin Gym after a thunderstorm came tearing through the Grad College and wouldn't leave. Each year when the banquet roles around, TigerBlog is amazed that another year has come and gone. It's not different this time. Right now, with a week to go, there are countless details that need to be finalized. They will be. They always are. The night will run smoothly. It always does. There's a lot that goes into this banquet, from a lot of people who work here. But it always runs smoothly. Hey, even the weather will cooperate. If it really is a high of 84 and a low of 61, then the evening at the Grad College could be pretty nice. And if it's really 90? It'll still be a nice night. The banquet is a celebration of the four years for the graduating class. The Class of 2016 will have a lot to celebrate. Princeton has won 43 Ivy League championships in the last four years. In the last two years alone, Princeton has won 27 league titles, with 21 different teams with at least one. The banquet last year was the first for which Princeton announced finalists for its top athletic awards, the Roper Trophy and the Von Kienbusch Award. It worked out really well, with the winner announced at the banquet. This year's nominees were announced the last two days. The five Roper Trophy - top senior male athlete - nominees are rower Martin Barakso, pole valuter Adam Bragg, swimmer Teo D'Alessandro, baseball player Danny Hoy and soccer player Thomas Sanner. You can read their accomplishments HERE. The six von Kienbusch Award nominees are lacrosse player Liz Bannantine, runner Cecilia Barowski, basketball player Michelle Miller, volleyball player Kendall Peterkin, fencer Gracie Stone and basketball player Alex Wheatley. Their accomplishments are HERE. Oh, and by the way, in case you haven't thought about the 2017 von Kienbusch field, it's an incredible group. Start with water polo player Ashleigh Johnson, hammer thrower Julia Ratcliffe, fencer Kat Holmes - all three have been out this year training for the Olympics. To that you can add soccer player Tyler Lussi, hockey player Kelsey Koelzer, lacrosse players Olivia Hompe and Ellie DeGarmo (named a first-team All-America yesterday) and probably some others that TB isn't thinking about off the top of his head. You're talking about some of the greatest women athletes Princeton has ever had. Ah, but that's for 2017. It'll be here soon enough. This is still 2016. A week from the banquet. There's more to the banquet than just the top senior athlete awards. There are also other awards, and recipients this year include such notables as John Thompson III and Clayton Marsh. As always, it'll start with the 90-minute cocktail hour. And it'll end with the senior-athlete video. It's gone from a small beginning in Jadwin Gym to what it has become, which is one of the signature events on the Princeton campus each year. And this year, the weather will be good. Or it won't. Either way, the banquet will still be great. TigerBlog isn't sure what the best lacrosse play he saw last weekend was. The two candidates are Brody Merrill's 85-yard shot in a Major League Lacrosse game and Olivia Hompe's buzzer-beater to force overtime for Princeton's women in their NCAA opener. Let's start with Merrill's shot. TigerBlog was on Game 4 of the first day of the NCAA tournament last Saturday, and Notre Dame was comfortably ahead of Air Force. It had been a long day of watching college lacrosse on TV - and his phone, for the first game, between Maryland and Quinnipiac, while he was at the Ivy League baseball championship series. So, he figured, he could see what else was on. And what did he find? Major League Lacrosse. How lucky was he? Anyway, he went from the college game to the pro game, between the Rochester Rattlers and the Boston Cannons. The matchup meant three Princeton alums were in the game - Boston goalie Tyler Fiorito, Boston defenseman Chad Wiedmaier and Rochester middie Kip Orban. By the way, Boston's next game is against the Ohio Machine, with two other Princeton alums, Tom Schreiber and Mike MacDonald. Schreiber leads MLL with 15 assists; no other player has more than 10. Fiorito is again among the league leaders in goals-against and save percentage. Anyway, as Air Force-Notre Dame wasn't that close, TB stayed with Rochester-Boston. He's sort of glad he did. As it turned out, Rochester led by two with a little over a minute to play and possession of the ball. There is a 60-second clock in MLL, and the Rattlers took it all the way down before throwing it into the corner behind the goal. There were 3.3 seconds to go. As a lacrosse field is 110 yards x 60 yards and the goal is 15 yards from the end line, Boston now had to go 85 yards. On the other hand, there's also a two-point shot in the league, so the game was not out of reach, even if it seemed completely implausible that Boston could make it happen. Merrill, who played collegiately at Georgetown and is the best longstick midfielder TigerBlog has ever seen, picked the ball up and winged it down the field. By the time the camera caught up to it, the ball was in the goal. And the Rochester goalie was there the whole time. How is that even possible? If TigerBlog gave Merrill 100 chances to do it again, even without the goalie, how many times would he succeed? If that had been the end of an NCAA men's championship game (one-goal game, forcing OT), it would be universally called the greatest play ever. It might have been the best play of the weekend, though. Olivia Hompe's goal against UMass at the end of regulation might have been better. Princeton and UMass played a great game in the opening round of the NCAA tournament last Friday in Ithaca, with eight ties and nine lead changes. It was tied into the final minute when UMass scored what figured to be the winning goal with 14.6 seconds to play. Amanda Leavell won the draw and was fouled, forcing a restart with 8.3 seconds left. After a Princeton timeout, Leavell threw it to Eileen McDonald, who lofted the ball towards the goal. TigerBlog, watching the videostream, thought for a minute that McDonald's throw had a chance to go in on its own. Instead, Hompe caught it and scored, with 0.8 seconds left. There is a one big difference between Merrill's goal and Hompe's goal. Both were incredible. Both forced overtime. Only Merrill's team won. Princeton fell 13-12 to UMass, ending its season. UMass then turned around and beat Cornell in the second round to earn a quarterfinal date with Maryland this weekend. Hompe went on to be named first-team all-region for the second time, following up on her second unanimous first-team All-Ivy selection. She had a team-best 59 points this season, with 47 goals and 12 assists. She will enter her senior year 11th all-time at Princeton with 175 career points, including 123 goals. TigerBlog hasn't seen them all, but his sense is that none of them were more amazing than the one with 0.8 seconds left against UMass. It might have been the best single goal he's ever seen. Or maybe just the second-best one from the weekend. The last four Ivy League championships of the 2015-16 academic year were handed out this past Sunday. Princeton won baseball and open rowing. Yale won men's lightweight and heavyweight rowing. And with those, all 33 Ivy League titles for the academic year of 2015-16 had been awarded. As TigerBlog mentioned yesterday, it was a seriously good year for Princeton Athletics. The collective Tigers won 14 Ivy championships, which matches the second-best total in league history. There have been six times in the history of the Ivy League that a school has won at least 14 Ivy titles in an academic year. Harvard has done it twice, with 14 both times (2004-05, 2013-14), and this is the fourth time Princeton has done it. The 2010-11 Tigers won a league-record 15 Ivy League championships. The 1999-2000 and 2000-01 Princeton teams won 14 each, and now the 2015-16 academic year joins that list. This is also the 23rd time that Princeton has reached double figures in Ivy League championships in an academic year. The only other school to win at least 10 Ivy titles in an academic year is Harvard; the Crimson have done it nine times, including this year, with 10. The competition Sunday also ended Ivy League unofficial all-sports points championship for this year. Princeton won for the 29th time in 30 years, with 208 points to 185.5 for second-place Harvard. Schools earn points based on their finish in Ivy standings, with eight for first, seven for second, and so on. If fewer than eight schools have a sport, then the winner still gets eight points. Also, if there is a tie, then those points are split. In other words, if two teams tie for third, then they both get 5.5 in that sport. The Ivy League has 33 official sports that compete for a league title. There are 17 for men and 16 for women. There are two men's rowing championships (heavyweight and lightweight) and only one women's (open), which explains the difference in the total number of titles available. Women compete in field hockey and men compete in football. Ivy has a champion in women's volleyball but not men's volleyball. Men have wrestling. Every other sport has a men's champion and a women's champion. Princeton's 2015-16 academic year might have been one off the overall record, but it was historic in one sense. Princeton's women's teams combined for 10 of the 14 championships, marking the first time in Ivy League history that one school has reached double figures in one gender. The year started with another first - Princeton swept the four Ivy League titles for women, which was the first time in league history that a team had won all of the championships available for one gender. Even beyond the 10 championships, Princeton had no women's team all year who finished in the bottom half of the league in any sport. That too is incredible. 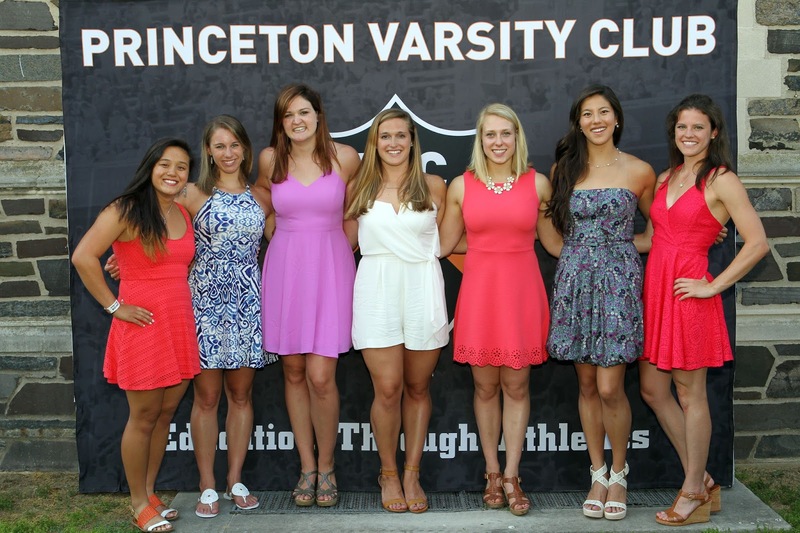 Princeton had 10 Ivy League women's champions and three more who finished second. There were two third-place finishes and one fourth-place finish. And the team that finished in fourth was women's indoor track and field, and the Tigers won cross country and bounced back to finish second outdoors. Of the three teams who finished second, two of them - women's swimming and diving and women's basketball - won a year ago. Princeton has long had a serious commitment to women's athletics. It dates back basically to the earliest days of women at Princeton, back to the early 1970s. Those pioneers of women's athletics here really set the stage for all of the success that has followed. TigerBlog has met many of them and heard them tell the stories of what it was like when women - and women's athletics - were so new to Princeton. They were, for instance, called "girls," and not "women." They had substandard practice equipment and access to facilities only when the men weren't using them. Athletic medicine? Strength and conditioning? Marketing and communications? The women were given the scraps. Despite that women's athletics here grew quickly. And it was because of those earliest women athletes, and the coaches and administrators who believed in them and encouraged them. By the 1979-80 season, the Ivy League awarded 13 championships for women - and Princeton won five of them. Today Princeton is a model for women's athletics, and for an institutional commitment to equity and excellence. And it shows. Clearly, the results speak for themselves. It's not easy to do what has just been done. 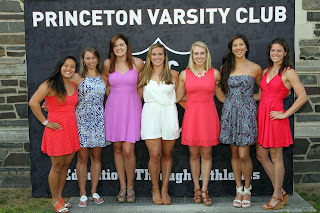 TigerBlog has long been in awe of the success of Princeton's women's athletes. This year, that's more true that ever. If you thought the five straight walks Saturday made for a different kind of rally, that was nothing compared to what was to come. The five straight walks came in Game 1 of the Ivy League baseball championship series. They were long forgotten by the bottom of the ninth of Game 3, when Princeton, shut out through eight innings, trailed by a run and were desperate for a baserunner. That came in the form of a lead-off single. Added all up, and it made it 2-1 Princeton, final. And that made Princeton the 2016 Ivy League champion. The baseball title was the 14th of the year and the second yesterday. The 13th came from the women's open rowing team. Princeton shocked top-ranked Brown to win the Ivy League women's open championship. The weather forced the schedule and location to be changed, to really, really early yesterday, with a 6 a.m. start. They moved the Ivy League Championships from Mercer Lake to Lake Carnegie. They moved the Championships from the afternoon to the morning. And then Princeton made a move more dramatic than either of those. field hockey, women's soccer, women's cross-country, women's volleyball, men's fencing, women's fencing, men's swimming and diving, men's indoor track and field, women's hockey, women's lacrosse, women's tennis, baseball, softball, women's open rowing. Beyond that, Princeton had seven other teams finish in second place in the league. And even beyond that, of the 33 Princeton teams who compete for an Ivy League title, an incredible 19 have won at least one championship in the last two years. Add in both water polo teams, and that's 21 of Princeton's 38 teams who have won at least one championship in the last two years. That's nuts, by the way. Think about it. That's 19 of 33 Ivy sports, or 57.6%. And 21 of 38, which is 55.2%. That's in two years, people. For all that, perhaps the most unlikely winner is the baseball team. Princeton had 11 Ivy League championship teams in 2014-15, but the baseball team wasn't one of them. No, Princeton went 7-32 a year ago, finishing 4-16 in the Ivy League. That was a distant, distant memory this weekend, when Princeton hosted Yale at Clarke Field in the ILCS. And a wild weekend it would be. It started before it ever started, when the weather forecast changed the format. Instead of two games Saturday and an if-necessary game Sunday, it instead became one game Saturday and the rest on Sunday. The crowd Saturday might have been the largest in the history of Clarke Field. Certainly TigerBlog doesn't remember a bigger one. Princeton trailed 6-5 into the eighth inning before the aforementioned five straight walks made it 7-6 Princeton. Yale then answered with two in the top of the ninth to win 8-7. All that meant was that Princeton had to win two yesterday. So what that the Tigers were 0-3 against Yale on the year heading in. So what. Chad Powers went seven strong innings in Game 2, and Princeton scored four in the second inning, which would be more than necessary in the 6-2 win. And so it was winner take all. Yale struck first, getting a run after three batters in the top of the first. That, though, would be it off of Cameron Mingo, who went all nine, allowing eight hits while striking out five. When he walked off the mound after his 117th pitch, he and his team were down 1-0. Down to their last three outs. From the time Yale scored in the first inning until Mingo got out of the top of the ninth, there had been 71 plate appearances without a run. Still, in baseball, it's about getting the last three outs, and that is never, ever easy with a championship on the line. Also in baseball, it's all about the "first." First out. First strike. First man on. Those things all change the dynamic of an inning. And so it was in the bottom of the ninth yesterday. The first man up was Danny Hoy, who ran the count to 3-1 and then lashed a single to left. Then it became nuts. A wild pitch moved Hoy to second. Then Danny Baer walked. That brought up Zack Belski, who had driven in eight runs in one game earlier this year. Do you bunt? Hit and run? Swing away? Belski squared to bunt and was nailed on the hand. The home plate umpire at first said no, but then the four umps got together - as Belski was trying to show them his hand - and ruled yes, it was an HBP. So now the bases were loaded, with nobody out. So now what? A fly ball ties the game. A hit wins it. How about another hit by pitch, this time Joseph Flynn. Tied, 1-1. Bases still loaded. Still nobody out. Next, though, came a strikeout, bringing Andrew Christie to the plate, still with the bases loaded now with one out. A double play gets out of the inning. A fly ball wins it. And so does a wild pitch. Baer sprinted across the plate, to a huge hug from Christie and a huge dog-pile from the team. It was a great moment. This was a team that went from last to first in one year and then won that championship in dramatic fashion. Princeton scrapped to this championship. Next up will be the NCAA tournament. The selections are still two weeks away, which will give Princeton a chance to celebrate and reflect on what it has accomplished. Eventually the celebration slowed down enough for the trophy presentation. And then there were the Tigers, holding the Ivy League trophy. To the victors go the trophies, and Princeton has clearly won a lot of them in the last two years. This one, though, was a little different, and maybe a little more special. If you're like TigerBlog, then you think this is one of the three best sporting weekends of the year. You know. The first round of the NCAA men's lacrosse tournament. Four games tomorrow. Four game Sunday. All on TV. The first two rounds of the NCAA men's basketball tournament, and of course Memorial Day weekend, which is the semifinals and finals of the men's lacrosse tournament in Division I and the Division II and Division III finals. Okay, every four years you can throw the World Cup in there too. By the way, odds are good you don't think like TigerBlog and that you like things like the Super Bowl or NBA playoffs or something. As for the 2016 NCAA men's lacrosse tournament, Princeton is not in it. TigerBlog, as always, is optimistic for next year. This year's event? It's completely wide open. TigerBlog's predictions for sporting events are usually awful. And this year's field is too unpredictable anyway. At various times this year, TigerBlog has thought five teams had a legitimate chance to win it all: Denver, Notre Dame, Maryland, Brown and Yale. Interestingly, they ended up as the top five seeds, so TB has some clue as to what he's talking about. To show you how completely nuts it is this year, TigerBlog could still see any of those five teams as the champion on Memorial Day in Philadelphia - or knocked out this weekend. Maybe not any of those five knocked out, but it wouldn't be shocking if even three of them lost in the opening round. The most consistent team this year has probably been Maryland. The team best built for a championship run is probably Brown, with the face-off man (Will Gural), goalie (Jack Kelly) and superstar (Dylan Molloy), as well as an outstanding, deep, veteran supporting cast and a somewhat unique style of play. Then again, there's the defending champ, Denver. The Pioneers can score with anyone and win face-offs with anyone. Their goalie (Alex Ready) is a freshman, which could be an issue. The last team to win a national championship with a freshman goalie is, TB believes, Syracuse, in 2008, with John Galloway. Bill Tierney, who has won seven NCAA titles, has never done so with a freshman goalie. He'll go with Syracuse (playing well, solidified goalie position, great face-off guy), Brown, Denver and North Carolina for the Final Four. He'll go Denver-Brown on Memorial Day. He'll take Denver to repeat. The women's tournament starts today. Maryland, the two-time defending champ, is unbeaten and the heavy favorite to make it three straight. Interestingly, Princeton is the last team to win three straight NCAA men's lacrosse championships, having done so in 1996, 1997 and 1998. On the women's side, dynasties have been more common. Maryland was in the middle of a seven-year run while Princeton was winning its three straight, and Northwestern added a run of five straight in the last decade. If the women's tournament goes according to seed, then the Final Four would be Maryland vs. Syracuse and Florida vs. North Carolina. TigerBlog would say that it's much more likely that those four all make it to Talen Energy Stadium (it's the one in Chester, home of the Philadelphia Union, formerly called PPL Park) than it is that the top four men's seeds all get through. Princeton's road to being a party buster for the Final Four would involve beating Maryland in the Final Four. The quarterfinal might be a week away, but it might as well be 100 years from now for the Tigers, who need to be fairly focused on the immediate future. Princeton opens the tournament today at 4 at Cornell against Atlantic 10 champ UMass, who comes into the tournament with a rather gaudy18-1 record, with a lone loss to Boston College. Put another way, UMass hasn't lost since March 2. Should Princeton get past that game, looming in the second round would be the winner of Cornell-Canisius. If ever two teams wanted to play each other, it is Princeton and Cornell. Princeton would love to get back at Cornell for knocking the Tigers out of the Ivy League tournament last week. Cornell would love to get another shot at Princeton for beating the Big Red during the regular season and costing Cornell a share of the Ivy League championship, which instead went to Princeton and Penn. Princeton and Cornell have split one-goal games. They'd love to see each other again. To make that happen, they need to win today. The games can be seen on the Ivy League Digital Network. NCAA tournament rules require that such videostreams be free, so you don't need an ILDN subscription to watch. There's other postseason play this weekend for Princeton teams. The baseball teams hosts the Ivy League championship series against Yale tomorrow and Sunday, hopefully with cooperating weather. You will need an ILDN subscription for those games. The women's tennis team plays Georgia Tech in the opening round of the NCAA tournament today at the University of South Carolina. . There's also the Ivy League championships in rowing this weekend as well. And, as TB said, the eight NCAA tournament men's lacrosse games. He'd like to watch all 16 or so hours, but he'll probably tear himself away to check out the baseball. He'll definitely be watching the women's game today. A year from now? Hopefully he'll be busy with the Princeton men at this time of 2017. TigerBlog got off the Jadwin elevator at around 12:30 yesterday and saw Lisa Van Ackeren was part of the lunchtime basketball game. It had been two days since Van Ackeren led her Princeton softball team to the Ivy League championship, defeating Harvard in a decisive third game in the Ivy League championship series, and it was four days before she was to find out where her team will be playing in the NCAA tournament. So why not play some basketball? Van Ackeren's team gave Princeton its 12th Ivy League championship of the academic year. It also put Princeton two Ivy titles ahead of Harvard for the year. Oh, and the Ivy League all-sports points championship? The unofficial one? Princeton has 5.5 point lead over Harvard at this point, but the Tigers are assured of gaining either 4.5 or 5.5 points on the Crimson in baseball. Princeton hosts the Ivy League championship series this weekend, taking on Yale. Because of that, Princeton will be at minimum 10 points over Harvard when the baseball playoff is over. It means that it is nearly impossible mathematically for Harvard to catch Princeton, which means that Princeton will have won for the 29th time in the last 30 years. The softball team finished second in its division last year, meaning that Van Ackeren's team became the fifth Princeton team to win this year after not winning last year. Add that to the 12 this year, and that's 17 different Princeton teams that have won an Ivy title in the last two academic years. Because the Ivy League crowns a champ in 33 sports, that means that more than half of the Princeton teams that compete for an Ivy title have won at least one in the last two years alone. Of all the stats that TigerBlog could come up with related to Princeton sports, that one might be the most impressive. It shows a total across-the-board commitment to athletic success here, from the department to the University as a whole. The four league titles still on the table - baseball, women's open rowing, men's lightweight rowing and men's heavyweight rowing - will be decided this weekend. Princeton did not win any of those four a year ago, so it is possible for the percentage of teams to win at least one in the last two years could go up. As for the four remaining championships, they're part of a busy weekend for Princeton. Not as busy as a weekend in November or February, but still a reasonably busy one. And the last busy one. It's also the end of home events at Princeton for the year. The baseball playoffs begin Saturday at noon on Clarke Field. Princeton and Yale will play twice Saturday, with a deciding game Sunday at 1 if necessary. The winner is the Ivy League champ and earns an automatic bid to the NCAA tournament. If you're wondering, Princeton was 7-32 a year ago and 4-16 in the Ivy League. This year has been an amazing turnaround, as the Tigers will bring a 22-18 overall record and 13-7 Ivy record into the weekend. Princeton went from last in its division a year ago to winning by three games this year. Yale swept Princeton 6-3 and 6-1 back on April 8 in New Haven, something that means relatively little for the rematch. The bigger issue for Princeton is that it hasn't played in two weeks, because Yale and Dartmouth needed last week for a playoff to decide the divisional title. In football, a week off to play a team that didn't have a week off could be a pretty good bonus. In baseball, you want to just keep playing. Of course, once the games start, that should be forgotten. The only other home events left on the 2015-16 calendar are the IC4A and ECAC track meets this weekend at Weaver Track and Field. The women's lacrosse team and the women's tennis team will be in the NCAA tournament on the road tomorrow, with tennis at South Carolina against Georgia Tech and women's lacrosse at Cornell against UMass. The winner gets the winner of the Big Red and Canisius. As for the rowing, the Eastern Sprints for men's heavyweights and lightweights are in Worcester, Mass. The heavyweight final could be a great one, as third-ranked Princeton will try to catch second-ranked Yale, with everyone else's trying to catch those two boats. The women's Ivy League championships will be closer to home, at Mercer County Park in West Windsor. Brown is the favorite there, but never count out Lori Dauphiny. By the end of the weekend, there won't be that many events left to the academic year. There will be the NCAA track and field regionals and championships. There will be the national championships in rowing. There will be the NCAA softball tournament and possibly the same for baseball. Women's lacrosse and tennis would love to still be playing. And that'll be it for 2015-16. It's already been a wildly successful year. And, with 17 different sports having won Ivy titles, a wildly successful two years. TigerBlog never met Irv Mondschein, the legendary men's track and field coach at Penn from the 1960s through the 1980s, including all of TB's time there. TB does know Brian Mondschein, Irv's son and the assistant women's track and field coach at Princeton. Brian was an All-America decathlete at the University of Washington as an undergraduate, and he has had a long career as a college track and field coach. Perhaps it's come from hanging around so close to Peter Farrell or maybe it's just how he's wired but Brian Mondschein is one funny individual. With him, the material is usually good, but it's the subtle delivery that really puts him over the top. Beyond that, though, Brian is also deep. Way deeper than TigerBlog would have guessed at least until he read Brian's entry in the "Tiger Writes" staff writing competition. It is incredible. Don't believe TigerBlog. You can read it for yourself, since TB asked Brian for his permission to reprint it as a Guest TigerBlog. And you can see all of the winning entries HERE. Years later I realized that the Jewpanese were not a bona fide ethnic group, which explained why I had never met any other Jewpanese children at school. “Do people really think like this?” I thought to myself, as I have often thought to myself during a lifetime of thinking things to myself. But I said nothing. The teachable moments are few for those surrounding the Jewpanese living in the South. Even as an adult living in the Louisiana, I felt my primary obligation was neither to correct nor instruct, but to survive, or should I say: live smoothly, without incident. And in that sense, I can find some similarities to the situation Southern students of color who come North for their education experience. When you live in a state where the saying, “Thank God for Mississippi and Alabama,” lingers as an afterthought to every national survey involving health, education and the general welfare of the populace, being part of “the other” prohibits you from speaking out in many situations where injustice is either perceived, detected, or runs rampant. It isn’t as easy as you would think to speak out about injustice, or to act in the name of social or racial equality, whether you are in Princeton, New Jersey, or Princeton, Mississippi, although the smart money says that when you do speak out, you are less likely to get bitten by a police dog in New Jersey. But nonetheless you sense things, you feel things. Things to you sometimes seem quietly not right. In Levittown, the paper boy on his Stingray bike delivered the news to our doorstep 365 days a year. He was probably four years older than I, two years older than my brother, and he wore boots with heels, his hair slicked and coiffed like the rock and roll singers of the time. Each day he would wait until he got to the end of our block, and then he would yell “Chink!” at my brother and me. It always seemed odd that he would never say anything when he was directly in front of our house. And I would never even look up at him, hoping that this was the day he had decided to stop yelling “chink” at us. But it never was. There came a day one November that my brother had had enough, and he confronted the paperboy. We rode off on my brother’s bike with me on the handle bars and my brother peddling down our street. We rode through a pile of yellow and brown leaves, and I kicked the pile with both my feet. It’s possible to think of your mind as a kitchen strainer or a common sieve. Most of your experiences pass through easily and are long forgotten, but for one reason or another, and sometimes it seems pretty random, things get trapped by the sieve. What’s interesting is that we don’t really get to choose what memories get trapped, what events in our lives make up who we are and how we think. One day something touches a chord in us, unleashing feelings that we never acted on or never knew we had, and we find ourselves doing things that surprise us and others around us. We are standing up for ourselves in a manner of speaking, or we are standing up for our brothers and sisters, or a group of people, or just people we feel connected to. Sometimes the injustice is so far removed from where we are at present that the standing up part almost seems contrived or misdirected. But doing the right thing always feels like the right thing, and, well, if we don’t like that there are people occupying the President’s office, think only to yourself that the President seems pretty good with it, so you might as well be too. Maybe he knows something that you don’t. As for myself, as untouched as I am as an adult by the transgressions of the real world, I am but one step away in my mind from the boy I was in Levittown, New York, watching my older brother fighting in the street against what I would now call ignorance, but what I thought of back then as tyranny. Perhaps the part of us that once felt alien and mistreated, while different for everyone, may be the key to understanding some of the things that are happening on our campus and in our country. And the Jewish part of Jewpanese? OMG. A whole other story. Tuesday Trivia: Who was the pitcher who threw a complete game to knock Princeton out the last time the Tiger softball team was in the NCAA tournament? TigerBlog will get to that in a few minutes. First, he wants to talk about the weather forecast he heard yesterday. It said that the rain was going to push out and that tomorrow - which is actually today - would be a beautiful sunny day around here. The only problem is that it wasn't raining yesterday. And it's not supposed to be a beautiful sunny day today. The whole thing made TB wonder if the forecast wasn't for a different day and it was actually replayed by mistake. It was curious. Anyway, the weather was one of the main stories of the Ivy League softball championship series, which began Saturday and didn't end until yesterday. Princeton, the South Division champ, was at Harvard, the North Division champ. It was best-of-three, with the winner to the NCAA tournament. Because of the persistent rain that lasted, oh, seemingly forever in the Northeast, the start of the series had to be delayed. As an aside, how exactly does BrotherBlog live in Seattle, where it's like it was around here the last 10 days for about nine months of the year? Anyway, Princeton won Game 1. Harvard went up 7-1 in the sixth inning in Game 2. Then it got too dark to finish. Then it rained again, making Sunday a washout. Well, not quite a washout. Andrew Borders, TigerBlog's Office of Athletic Communications colleague and the softball contact, said he went to the battlefield at Concord Sunday. You know. Concord. April 19, 1775. The start of the American Revolution. Paul Revere. The Minutemen. As for softball, though, there wasn't any. Instead, it had to wait until today. Harvard, as the home team, was at home, as it were. Princeton was on an indefinite road trip. TigerBlog has always thought that being on the road in the Ivy League can be a blessing, since it gives a team a chance to get away from everything on its own campus, bond as a team and focus on the task at hand. That's the situation Princeton was in during the weather delays. When play was able to be restarted, Harvard quickly closed out Game 2, creating the make-or-break Game 3. Princeton would only score in one inning of Game 3, though the Tigers made it count in a big way. Princeton put up eight runs in the second inning and then Shanna Christian made it stand up, as Princeton won 8-3. In true team fashion, Princeton had six different players drive in at least one run in the inning. Christian, a senior from Colorado, was also the winner in Game 1. TigerBlog doesn't really know any of the softball players other than Kayla Bose, a senior who drove in two in the second inning and who works for the marketing staff on game days and at other events, and Riley Wilkinson, a freshman pitcher who played the piano while lacrosse player Sam Gravitte sang in one of the "Who's the Tiger" videos in the fall. The win vaulted Princeton into the NCAA tournament. The Tigers will find out where and when they play this coming Sunday. For Princeton, it was Ivy League championship No. 12 for the academic year of 2015-16. And it was a big one, for bragging rights at least. Princeton had 11 Ivy titles prior to Game 3. Harvard had 10, after the women's track and field title Sunday. If Harvard had won the softball game, then Princeton and Harvard would have been tied. Instead, Princeton now is two up, with four championships still on the table - baseball (Princeton hosts Yale this weekend in a best-of-three) and three rowing. For Princeton head coach Lisa Van Ackeren, it was the first Ivy title after three straight second-place division finishes. Van Ackeren, who TB is guessing isn't even 30 yet, is off to a pretty good start to a coaching career. In a short time she has definitely become an important part of the Department of Athletics fabric. She - and her husband Brendan, who works for the Princeton Varsity Club - are fixtures at any number of Princeton sports, and she is the kind of person you love to have representing the department and University. And that was before she won an Ivy title. And so congratulations to the Tigers on winning the Ivy League softball championship. Princeton's last NCAA softball appearance was in 2008, when the Tigers played in a regional at UMass with the host team, Stanford and Lehigh. The Tigers were eliminated by Lehigh, who got a complete game and an RBI from Lisa Sweeney, who improved to 26-5 with the win. And who is Lisa Sweeney? Well, she's now Lisa Van Ackeren. This time she'll be rooting for Princeton. Cecilia Barowski was in third place when she took the baton on Weaver Track yesterday in the 4x400 relay, the final event of the meet. TigerBlog, watching from the concourse, had two thoughts. First, he thought, this was over. Barowski was going to catch both runners ahead of her, and Princeton would win the race. Second, he thought, this is it. This is the last lap, the last 400 meters, of the last Heps for Peter Farrell as the head coach of women's track and field at Princeton. As Barowski caught up and then took the lead, TigerBlog's next thought was actually a question. If you added every athlete in every event who competed for Farrell at Heps since 1977, how many miles of racing would you have? After all, you're talking 39 years worth of Heps. With cross country and indoor and outdoor track and field, that's 117 Heps for Farrell. Before TigerBlog could come up with a figure, his attention was diverted. Barowski had zoomed to the front, and she won going away, bringing Princeton home by nearly a second. It was the end of a day that was sunny and windy, one of those days where if you stood in the shade you were cold and in the sun you were hot. When it finally was over, a party of sorts broke out. It's rare that the team that comes in second celebrates to the extent that the Princeton women did, but that's how it worked out on the grass infield. There were chants of "Peter, Peter," mixed with pictures and videos and hugs and smiles. Farrell's brother Tom, an Olympic bronze medalist, was among those there. TigerBlog has already written about Peter Farrell since he announced this would be the last year for him as the only head coach of Princeton women's track and field. You can read it HERE, though odds are good you've already read it, since it's the most read entry in TigerBlog history. There's a difference, though, in writing about something that is coming and standing there watching it as it unfolds. This weekend wasn't end of Farrell's career. Not quite. In fact, it wasn't even the end of his home career. Princeton will host the IC4A and ECAC this coming weekend. And then there is the NCAA regional, which will be the last weekend of May in Florida. And the NCAA championships in Eugene, Ore., in June. Peter was honored after the meet yesterday with a gift and a nice tribute, but it was hard to hear what was being said, since the party on the infield sort of took over. This was exactly what Farrell didn't want, anything farewell tour-ish, but too bad. Someone with his career and persona has to accept that those from his team and from the teams against whom he has competed for so long will want to recognize this. And so that's what happened. As for the meet itself, Princeton's men and women both finished second, behind Cornell on the men's side and Harvard on the women's side. There were success stories for both teams. On the men's side, there was Greg Leeper, who won the 400 meter hurdles. TigerBlog didn't see the race, but he heard the end as he walked toward the stadium. If you want the complete recap of the men's Heps, click HERE. If you want the complete recap of the women's Heps, click HERE. If you've never been to a Heps, it's just non-stop motion, as one event blends in to another event, often with overlap of one event and another. There are runners who blaze down the straightaway, going right past jumpers who pause before beginning down their own runway, only in the other direction. There is so much going on at all times. Look across the field, and there's something unique about each person you see. For TigerBlog, though, this Heps was about Peter Farrell. It's hard to imagine a Heps without him there. Coaching track and field is a little different in that the coaches can take time away to have a conversation during the event, something that doesn't work in basketball or football or most sports. TigerBlog has been a bunch of Heps events, not as many as Farrell, but a bunch. He's talked to Farrell at each of them, and it's always sort of interesting to see how a coach in the middle of a league championship event feels. Before the race, TigerBlog saw Princeton coach Peter Farrell and asked him if he was nervous. Farrell's response was "you don't have to tell me it's race day." He was quoting someone. TigerBlog isn't sure if it was a real person or a fictional character. Either way, TB is also not sure if Farrell was nervous. TigerBlog doesn't think Farrell was nervous yesterday. He was, possibly, anxious about how this was his last Heps. He was also happy with the way his team played. After the hugs and the presents and the pictures, Peter was asked to do an interview. As he walked away, he said to the reporter: "let me tell you a story." TB couldn't hear what Peter was saying, but whatever his story was, it was a long one. And, if TB had to guess, a funny one. Maybe at some point Peter thought to himself that his days of doing these kinds of things were dwindling, but TB doubts it. Nah. Peter just had a funny story to tell, so he told it. That's how he is. This was his day. This was his environment. Heps wll be there next year. It won't be the same without Peter Farrell. TigerBlog ran into Matt O'Connor of the men's lacrosse team the other day. O'Connor was a few days removed from the last game of his Princeton men's lacrosse career. To say it had gone well for him would be an understatement. O'Connor, a senior goalie, came in at halftime of Princeton's game against Cornell last Saturday and put up the best performance of his career, making 11 saves while allowing two goals as Princeton won 7-6. It was the last game of the season for the Tigers, who did not reach the Ivy League tournament. At the start of each season, reaching the Ivy tournament is probably the first of several goals. On the other hand, because Princeton was not going to be in the Ivy tournament, it did make last Saturday's game against Cornell as a pretty good way to go out. Most teams do not win their last game - Princeton did. And they did so dramatically. It was senior day, and it was a senior who scored the game-winner, when Ryan Ambler scored his 76th and final goal with four minutes to go. And it was O'Connor, who had started 16 games as a freshman and sophomore, who made it stand up, with five third-quarter saves and then six more fourth-quarter saves. When it ended, O'Connor lifted his arms over his head in celebration. It made for a great moment. Before turning the page on the 2016 Princeton men's lacrosse season, TigerBlog wants to mention a few things. First, there's Gavin McBride. The junior didn't earn any All-Ivy League recognition after leading the Tigers with 26 goals. Only six players in the league scored more than he did, and all six of them were on one of the all-league teams. McBride finished the season with at least three goals in five straight games. It's the longest streak at Princeton since Sean Hartofilis did it six straight times in 2001. You know who else in the Ivy League this year has at least three goals in five straight games? Nobody. Not Dylan Molloy. Not Ben Reeves. Nobody. McBride has established himself as one of the best - and clearly most consistent - scorers Princeton has had in the last decade or so. He isn't flashy or showy, but he gets open and he finishes. McBride went from no goals as a freshman to 24 last year, which are the most by any Princeton player as a sophomore who did not have any as a freshman. Austin Sims almost caught McBride this year, finishing with 23 of his own to earn second-team All-Ivy honors. Sims will spend his summer with the U.S. national U-19 team at the World Championships in British Columbia. That experience will only make him better for his last two seasons - and he already has All-America level talent. Zach Currier was a first-team All-Ivy selection. The junior will be back next year for one more year of doing what it is he does - which is namely everything. There can't be too many midfielders, if any, who have played more minutes than Currier this year, who faces off, plays on the wings on face-offs when he doesn't, plays in the first and second offensive midfields and often finds himself on the defense end of the field. Currier put up 31 points this year with 14 goals and 17 assists. He also ranks 10th in the country in ground balls per game; none of the players ranked ahead of him had more than 13 points and only two of those nine reached 10. When Tom Schreiber played at Princeton, there was a level of excitement every time he touched the ball, because you never knew what he would do next. In Currier's case, that excitement comes when either the ball is loose. Lastly, TigerBlog wants to say something about Ambler. The first time TigerBlog saw Ambler play was against TigerBlog Jr., when Ambler was a senior in high school and TBJ was a freshman. TigerBlog introduced himself after the game and explained that he'd be seeing Ambler play a lot in college. From that day, TigerBlog was impressed with his maturity. Ambler's, not TigerBlog's. Ambler finished his career 10th all-time at Princeton with 168 points (76G, 92A), and his assist total is seventh-best in program history. Only Ambler, Schreiber, Jon Hess and Dave Heubeck have more than 75 career goals and 90 career assists. Ambler was a total workhorse in his time at Princeton, and he was the foundation of some really good offenses. He played hard all the time and made the players around him better, which is the best thing you can say about someone who plays attack. So that's the men's season. The women's season is still going strong. Princeton opens the Ivy League tournament against Cornell this afternoon at 4 at Penn's Franklin Field. The host Quakers take on Harvard in the second game. The championship game is Sunday at 11 a.m.
To the winner goes an automatic bid to the NCAA tournament. To at least one and probably two of the others will go an at-large bid. It's hard to imagine that Princeton and Penn aren't complete locks for the NCAA tournament. Cornell is probably in as well, though if Harvard should win the tournament, it would change things a bit. Princeton or Penn, in fact, will be in the conversation to host the first two rounds by winning the tournament. Princeton won the Ivy tournament a year ago and has won three straight Ivy League championships. Princeton is led by goalie Ellie DeGarmo, who was the unanimous Ivy League Defensive Player of the Year. She's also a Tewaaraton Trophy nominee, of which there are 25. A team that is hoping to make a nice postseason run could do worse than be led by such a goalie. Olive Hompe, like DeGarmo, was a unanimous first-team All-Ivy selection. Also like DeGarmo, Hompe is one of the 25 nominees for the Tewaaraton Trophy. Just a junior, Hompe has already vaulted past 100 career goals. She has 41 this year, along with 11 assists. Princeton's other first-team All-Ivy pick was Liz Bannantine, who earned All-Ivy honors for the fourth time, with two second-team and now two first-team selections. Princeton and Penn are the only two schools ever to host the Ivy League women's tournament, now in its seventh year. Penn defeated Princeton in the regular season this year; Princeton beat Penn in the regular season last year and Harvard and Penn in the Ivy tournament before winning two NCAA tournament games. The NCAA field will be announced Sunday. This weekend is a good prelude to next. The Princeton women are still playing, and in many ways, the season is just starting for them. The Princeton men are not still playing - but they did win their last game. Not too many teams will be able to say that.